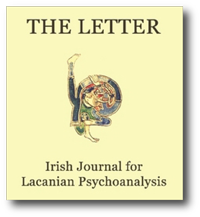 We publish the final part of Cormac Gallagher’s translation of Lacan’s L’étourdit – the Second Turn, Chapter 4 – Interpretation. Herein it is argued that language is the condition of the unconscious, and the unconscious escapes linguistics. That interpretation is seconded by grammar, and that Freud’a approach is also grounded by this function, brings a new light to the role of grammar in psychoanalysis. Lacan specifies that the woman as notall opens up the moment of truth and the moment of the real for the l’hommodit. The last words of this monumental work echo the attempt to give a clinical demonstration to the interplay between the said and the saying, and that it is by the impossible of saying that the real is to be measured – in practice? This paper gathers remarks made by Freud which differentiate the practice of psychoanalysis from psychotherapy. It will also draw from Lacan’s Seminar 24, L’insu qui sait de l’une bévue, s’aile à mourre, for its consideration of the concept of the unconscious in 1976. First of all I would like to thank Ros McCarthy for her words of introduction, which are generously brief. The truth is much more problematic in light of the topic of today’s study-day. As well as the practice Ros mentions I am employed in a number of roles, the titles of which combine the terms psychoanalysis and psychotherapy. Currently, still, I carry the titles of Head of a Department of Psychotherapy, Course Director of a MA in Psychoanalytic Psychotherapy (a training in psychotherapy), Director of a SpecificModality training in Psychoanalytic Psychotherapy and tutor on a MSc in Psychoanalytic Psychotherapy. More worryingly, I have at times announced that I practice psychoanalysis and psychotherapy. I am uneasy. I am concerned that the officersof the Trade Descriptions Board may one day come knocking on my door. I believe I need to clarify my position. Today’s study-day has given me an opportunity to address this question of mine because I also believe that I am not alone in having such a question to address. Guy Le Gaufey – What Subject is it? Gérard Amiel – In what Ways does Psychoanalysis Differ from Psychotherapy? Let us begin with a brief historical reminder. If we go all the way back to the origin of psychoanalysis, back to the time when it was first invented by Freud, the first objective of psychoanalysis was to try to resolve the symptom, particularly the hysteric’s symptom. Little by little, this approach ended up having a great influenceon the firsttheoretical writings of psychoanalysis, as well as definingthe structure and essential conditions of the cure. So, in its early stages, psychoanalysis was more like a form of therapy. But, as most of you are probably aware, over the past hundred-plus years, the word “therapy” has significantlyevolved, to the point where it no longer means quite the same thing as it did before.